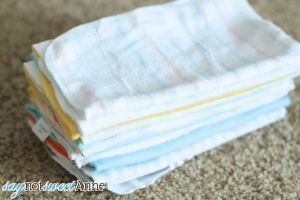 One of the bigger decisions that hubby and I made when we became parents was choosing to cloth diaper and use cloth baby wipes. It’s a strangely polarizing issue (I say strangely, because I can’t think of any other time a person would be indignant or upset that another person would recycle rather than throw something away) and we have had plenty of discussions with friends and family about our reasoning. Our reasoning boiled down to a list of pros and cons, where the pros of cloth diapering were a better fit for our lifestyle. It’s just what works for us, and it doesn’t work for everyone. Aside from one disposable diaper overnight each day we’ve been successfully cloth diapering for two years now. Kiddo is a really heavy night wetter, and after we tried all manner of wool, bamboo, treated and oiled cloth diapers to contain his night wetting, we decided to stick with a disposable for that one scenario. But that’s not all! 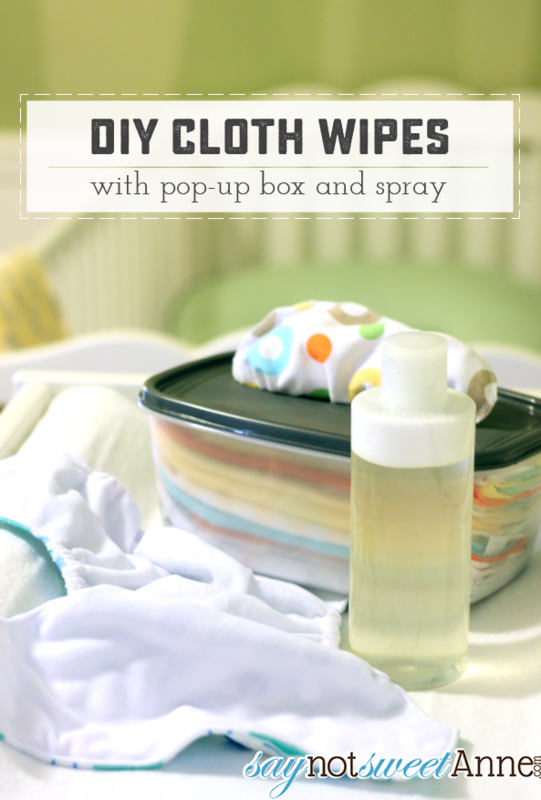 You see, since we’re doing the laundry anyway – why not go ahead and use cloth baby wipes too? I mean, it seems silly to split the difference, and it is very little extra work. 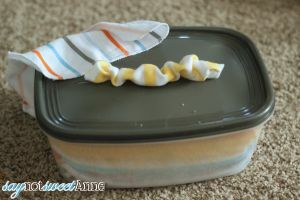 I’ve gone ahead and made a sweet wipe box with the same pop-up action that disposable wipes have, along with a great spray for baby’s bottom. Hubby and I like the dry wipe/spray combination better for our lifestyle because I don’t want to worry about mold inside a wet, closed box. I also omit any essential oils because I don’t think there is enough research about how they affect tiny humans. I think they are powerful things, and should be taken seriously and used with caution. For the wipes themselves we use baby washcloths. We found some sets of baby washcloths in super cute colors and patterns on sale, so we grabbed a bunch. Flannel wipes would be softer, but Squish doesn’t seem to mind and I like the texture for getting him really clean down there. 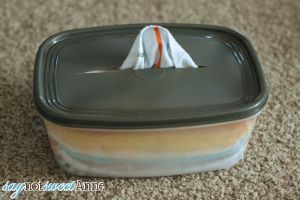 The box is just a dollar store tupperware that is wide enough for the folded wipes to rest in. Add in a spray bottle of wipe solution and everything is good to go. The wipes couldn’t be any easier. The pop-up feature of disposable wipes is simply a function of folding. By accordion folding the washcloths, you create a friction that pulls the next one up when you take a wipe. Start with one wipe laying flat. Lay another wipe on top, overlapping by half. Fold the top wipe in half, lay another wipe down and repeat. 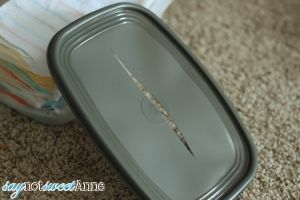 Once you’ve got your stack of dry wipes, cut a slit in the lid. It should be just wide enough for the wipe to come out, bringing the next with it, but not wide enough for the wipes to slip back down into the box. Combine all of the ingredients in the spray bottle. The distilled water is important because tap water brings in elements, microbes and other things that might go bad with time. We want this stuff to stay fresh. The vinegar should help with disinfecting and mold/yeast growth, while the alcohol helps the oil and water to blend a bit better. That said, you will want to shake the mix each time you use it, and make only enough for 7 days or so. That’s it! I know, its is too easy right! ?